Welcome to CBI’s Religious School. 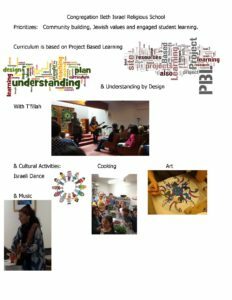 Our children are part of a learning community which explores Judaism through engaging in year long projects. Religious School, for children in grades K – 7, meets on Sunday mornings from 9:30 – 12:00. It begins on September 23, 2018. 6th & 7th graders attend on Saturday morning, instead of Sunday, once each month. Hebrew School begins for children in 4th grade, or 9 years old (which ever comes first). Hebrew School meets from 4:30 -6:00 on Wednesday afternoons starting on September 26, 2018. Students in the B’nai Mitzvah class begin at 4:00. Aleynu (it is upon us), is a pilot teen leadership program for students in grades 8-12. There are several components of this program: Wednesday evening classes, teen created pop-up events, and being a madrichim (teacher’s aide). It is not necessary to register for the madrichim program. It is not necessary to complete Religious School registration for the madrichim program. Every other Wednesday evening (approximately) teens meet from 6:00 – 8:00. After socializing over a brown bag dinner, students engage in a Limud (core) class followed by a Chug (elective). Classes vary each 5 session trimester. Teens are given the opportunity to choose 2nd & 3rd trimester topics. Leadership training is an additional component which will assist teens in creating their own one-time events. Additionally, trips are planned to San Francisco (8th & 9th grade) and Washington DC with the Religious Action Committee (10th – 12th grade). Creating community is an important value to us. We consider the variety of activities at CBI to be part of our children’s education. Youth Group activities, class dinners, family events during the school day, and Shabbat services, give us opportunities to connect and get to know each other. We teach our children that they belong to the Jewish community when we model active participation. We have streamlined the Religious School registration to make the process easier for everyone. Please click on the link for the appropriate form. Re-enrolling will not involve filling out the full registration form again (we do listen to your concerns). We have reduced the amount of information we need you to re-submit as much as possible. Please click the Returning Student Re-enrollment form for 2018 – 2019 to register a RETURNING student. This form applies to all returning students in grades 1 – 12. This is an online submission. The Early Bird discount and late fees will be applied in relation to our receipt a completed registration form. Any child new to the school (regardless of whether or not an older sibling is a student) will need to through the new student registration form. Please click the New Student Registration form for 2018 – 2019 to register a NEW student. This form applies to all returning students in grades K – 12. This is an online submission. If you are registering a third child, please click the Third Child form. This is not an online submission. Please fill out and return to the CBI office. We sincerely hope these changes make annual school registration easier for you. We look forward to learning with you and your child again in the fall. For more about our religious school curriculum, click here. Click here for information about summer programs and camps, including Campership applications. For more about our Hebrew school curriculum, click here. Please click here for an important letter from our educator.